At any given time, our freezer contains several different varieties of popsicles, push-ups, ice cream and other frozen novelties. My kids are huge popsicle and ice cream lovers (what kid isn't?). Some of the frozen treats in our ice box are homemade and some are store-bought. Throughout the years, we've collected several types of popsicle molds. The kids have their favorite ones, but it really never matters what type of appearance the popsicles have. So long as some exist in our freezer, they are happy! Due to the addition of large amounts of sugar, artificial dyes and other not-so-healthful ingredients in many store-bought popsicles, I've turned to making batches at home more often than I used to. This allows me to control the ingredients a little better and it gives me the opportunity to slip in some real fruit. I adapted this recipe from a Martha Stewart recipe that she calls "Firecracker Ice Pops." She presents the recipe as one to make in celebration of the Independence Day holiday. I contended that my kids wouldn't care what holiday it was or wasn't. These babies would - I was certain - be a hit anytime of the year in my house! And, I was right! With the exception of my teenager daughter (who doesn't like blueberries), this recipe pleased the taste buds of everyone in the house! This made 18 ice pops. But, the amount really depends on the size of your molds. 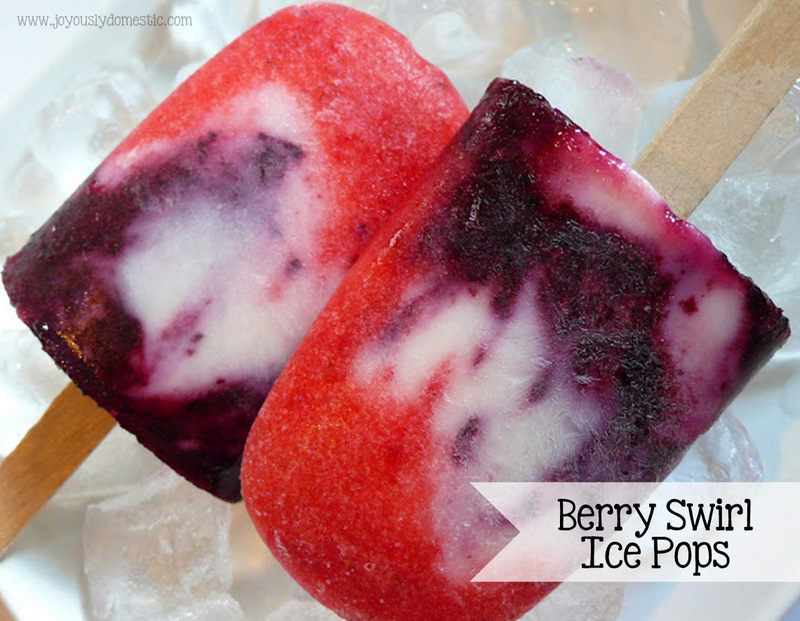 Next, alternate the two berry mixtures with the yogurt in your popsicle molds ... creating 3 - 5 layers. Using a skewer, swirl the mixture a bit in an up and down motion. If using the plastic sticks that came with your mold set, insert the sticks at this point. If using wooden popsicle sticks, allow the popsicles to start freezing a bit, then insert them when they will stand freely in the mixture (usually about 30 - 45 minutes after putting the molds in the freezer). Freeze until solid, about 3 - 5 hours and keep for up to one week in the freezer. NOTE: I used fresh strawberries and frozen (thawed) blueberries for this recipe. I imagine fresh or frozen of either would work fine. Also, this recipe can be changed up a bit using any types of berries ... blackberries, cherries or raspberries. It's up to you if you want to strain the berry puree or keep the seeds in the puree. I have made something similar to these ... with the fruit like this, but never adding yogurt. I think I will try it this way! Thank u for sharing this recipe.